The 'Vedas' are the Supreme Texts and their origin is Transcendental. Such supreme texts conferred a paramount status to Sri Radhaji that is unequalled by any God or Goddess of universes. Brahma Deva declared in the Radhikopanishad, 'My longevity is insufficient to describe the Treasure of Divine Qualities of Radhaji.' This unique and sacred Upanishad also stated that one who worships Sri Krishna without first knowing Radhaji's presence is indeed a great stupid. The Supreme Lord with a view to manifest all His latent ecstatic features (Rasa) in His Divine Play Himself became Sarveswari Sri Radha. Sri Krishna declared that Sri Radha is His Deity of worship and it is impossible for Him to praise Her virtues. Sri Radha is the repository of compassion. To grace the Rasik Devotees, she descended to the Earth in an unprecedented manifestation. No Divine Incarnation has shown such an extraordinary Leela (play) of descent. Sri Radha assuming the form of a small girl descended and revealed herself at village Ravali in the Vraj Mandal. Her birth was not of human origin. At the early hours of Suddha Ashtami (eighth day after New Moon) of the month Bhadhrapada, Sriji manifested Herself as a two-year girl child. Raja Vrishabhanu, who had a premonition about the arrival of the Divine child, reached the place of descent near Ravali along with his entourage. Amidst sacred Vedic recitations and symphony of various musical instruments the king took Her along in a golden palanquin to his palace. Later, as She had attained the age of 12 years She left the earthly plane along with Govinda for Her Transcendental Abode-Ras Brindavan. That is why She is acclaimed as 'Sada Dvadasa Varsheeya' (always 12 years old). In our land Sri Krishna's Name, life history and His philosophy of love are widespread. However Sri Radhaji's Swaroopa Tatva (philosophy), Leela Madhurya (Divine Play), Nitya Prasanna Kala (Ever charming presence) was not familiar in many regions. As a result even the learned persons in the society assume that Sri Radha is an ordinary Gopika or Lover of Sri Krishna or else they tend to have a feeling that, like Lakshmi Narayana and Seeta Rama they too are related as wife and Husband. But these assumptions have no relation with Truth. We regard that it is our pious duty to reveal the world about this absolute truth. We travelled through the length and breadth of the Leela Kshetra of Radha Krishna- Sri Brindavan for a few years and had studied the averments of number of ancient books. The perusal and comprehension of these Holy Texts have ultimately presented us a clear picture proving that the earlier understanding is nothing but a perverted form of reality and has no relation with Truth at all. Because of worship by Krishna she is known as Radha. She is also renowned as Radhika teaching the universes by Her worship of Krishna. Wherefore in the Vraj Sri Radha is resplendent as Parama Guru (the Supreme Master). One who doesn't worship Sri Radha is not eligible to worship Krishna. Such averments by scriptures unfold the secret that Sri Radha is the Goddess of worship of Krishna. The Lord manifested himself many a time upon the Earth to protect the righteous. In each of his incarnations He eliminated the wicked-minded and the cruel with weapons like Sudarshana Chakra(wheel-shaped weapon). Such actions have ended the lives of wicked-minded. But their wickedness was not eliminated. As a result, they later assumed demonic forms and continued to create disturbances in the world, unseen. But Sriji Radhaji without even touching the wicked, without uttering a single word, removes the wickedness ingrained in them by transmitting the waves of Divine Love. The Leela (Divine Play) that was displayed by Sri Radhaji in the sacred Life of Harivamsa Prabhu, which has been narrated in this book, is a shining example to Her invincible power known as Hladini sakthi. Sri Radha is the life breath of Krishna. She is controller of Krishna. She is the master of Gopala's Raas. The sound Ra..dha.. is spontaneous in its origin. The letter 'Ra' connotes generosity and graciousness. None other than Sriman Narayana told Narada that Sriji's pre-eminence in bestowing liberation to the Seeker is unequalled by any other God or Goddess. Sri Radha is the repository of Divine Love. When she descended to the Earth, she bestowed upon the Jeevas to the great Principles Divine Love. Divine principle 'Thath Sukhena Sukhithvam' '( in your happiness lies my happiness'). She herself set an example by practicing this principle. One day Sri Radha saw a vision that Kanhaiya was shedding tears of Divine Lover incessantly chanting 'Radha '¦Radha'. Forthwith she ordered Sakhis to chant Her own name in Her Nikunja instead of Krishna's Name. For Radhaji the pleasure and happiness of Krishna is the sole preference and nothing else. It is but natural that the ignorant Jeeva tends to lead a strayed life in the world. The way to mend and mould the mind of ignorant Jeeva is known only to Krishna 'The Supreme Master of the Universe. He cures the ailment called Avidya (attachment to prakrithi) through His myriad majestic methods and ultimately leads him to Vrindavan Dham and to the Lotus Feet of Radhaji. Sri Radhaji's Power known as Hladini Shakthi is the supreme among Divine powers. With a single glance, with a single touch she immerses the mind of Jeeva in Divine Ecstasy. So munificent She is! She evolves the jeevas surrendered at Her Feet by Krishna into Rasik Devotee (Devotees of Rasa). She has taken a few Devotees who unflinchingly surrendered to Her. Boy Rehman, Shyamanandaji, Hita Hari Vamsa Prabhu and Sevakji's life histories acquaint us how Sriji taken them into Her Nikunja Leela, with no trace of their physical bodies upon the Earth. Many a sacred books such as upanishads, puranas, Samhitas, and Tantras have proclaimed the super-eminence of Sri Radhaji Sarweswari Sri Radhaji (Creator of Universes) the Goddess worshipped by Sri Krishna. Innumerable authoritative pronouncements in the above Sruthi, Smrithi, Puranas revealed that the philosophy of Sri Radha (Radha Thatva) is infinite, extraordinary and unfathomable. The Parama Purusha's Love, Beauty, Play and Tenderness that are manifested as Radha are incomparable and transcend comprehension. "Sri Radhaji is the essence of Divine magnificence and splendour. 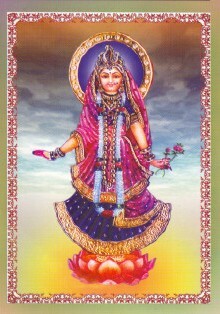 The Transcendental Mother is personified Madhurya Swaroopini (Divine Ecstasy). She is the origin and nourisher of Divine Ecstasies. She is the glorious Divine personality standing beyond various devotional practices enshrined in different spiritual traditions of Bharatha Varsha (India). She is meditation (dhyan) and the result of meditation (dhyeya) as well. She is Sadhana (practice) and Sadhya (the goal of Sadhana) as well. She is everything. The Indian Literature became sacred by Her Divine Luminescence. She is the supernatural form of Divine Love roaming in the realms of spiritual literature. Her light of love is all pervading. After recognizing Her manifestation the pens of poets started effusing Divine Elixir. She is Divine Light of Rasa (Supreme Divine Ecstasy). She is the embodiment of splendours of Rasa and its glorious effulgence. The endeavour of a singer to hear the musical sounds of Her anklets in his songs or the painter's adventure to reveal Her beautiful Divine Image or a sculptor's soulful attempt to carve Her glorious Form - all these attempts are thoroughly incomplete. Is it possible to depict an unlimited object with limited tools of art.?" Such discussions continued for three days. The philosophy of Sri Radha was revealed to the world on the basis of Vedic literature in this unique conference. The author of this book has decided to release 8 volumes containing 2000 pages in a series named as 'Brindavaneswari Radha'. These books reveal the Divine philosophy, play and ever-munificent nature of Sri Radhaji. For the well being of the world so far we have released 1) Sri Radha Para Tathvam, 2). Brindavaneswari Sri Radha Vol I 3) Brindavaneswari Sri Radha Devi Vol.II and distributed them to devotees free of cost. We are not writing this third volume out of our volition. In deference to the order of Sri Radhaji, offering devotional prayers, our society had resolved to release this volume. The author has felt that it is his pious duty to present the world the Holy Revelations about Sriji at least to a certain extent that were reverentially extolled by the sacred Vedas. We have resolved to overcome any number of impediments coming in the way of completion of these volumes and also resolved to distribute these books free of cost to the earnest devotees who have avowed to read them with devotional love and sincerity. May such devotees be blessed with the grace of Sri Radhaji. We have also decided to release this volume in three languages (Telugu, Hindi, and English) to disseminate the sweet fragrance of Rasika Bhakthi throughout the world. The Life of Sri Radhaji is replete with great Divine plays that are not visible in the annals of any religion. At present Sri Dham Vrindavan is the most important centre of Devotional Love in the world. Many kings of Jaipur, Bhopal, Ajmer have built magnificent Radhakrishna temples in Vrindavan out of devotional love. But the most significant and inspiring fact is the Divine plays that are revealed directly by Sri RadhaKrishna even today. I will not move a single step out of Vrindavan. The avowal of Sri Krishna is proved to be true every moment in the Sri Dham Vrindavan. We also present the readers in this volume, the verses of Sri Radha Sudhanidhi, which were revealed to the world by Divine voice in the lifetime of Rasika Siromani Sri Sri Hitha Harivamsa Prabhu. It is my great fortune to propagate the philosophy of Sri Radha and the Divinity of Radhaji's Name all round the world and to dedicate my life at Her Lotus Feet as an instrument and I regard this as the result of my Purakritha Sukrutha (blessed consequence of pure deeds in the past).